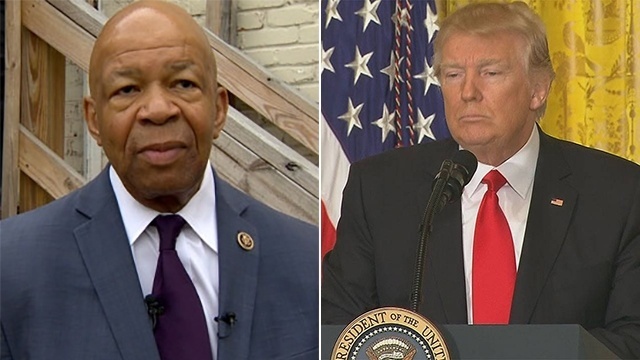 During a rambling and wide ranging press conference, Trump accused prominent African-American Rep. Elijah Cummings of cancelling a planned sit down for political reasons. "I actually thought I had a meeting with Congressman Cummings and he was all excited and then he said, 'Oh I can't move it might be bad for me politically. I can't have that meeting,'" Trump said. The president then said Senate Minority Leader Chuck Schumer or "some other lightweight" likely pressured Cummings to cancel the sit down. Cummings, a former chair of the CBC, denied ever having cancelled a meeting with Trump and said the leader of a different chamber of Congress never spoke to him about it. "I have no idea why President Trump would make up a story about me like he did today. Of course, Senator Schumer never told me to skip a meeting with the President," Cummings said in a statement. The Democratic congressman said he was looking forward to speaking to the president about the price of prescription drugs.